I’m beginning to think this blog is cursed. In a week when Wigan exposed Manchester City’s fleshy behind at Wembley, one would have assumed that this was embarrassment enough for the chaps from East Manchester. Not so. The footballing gods demanded further sacrifice. Despite guiding Manchester City to their first league title since before Sheikh Mansour was born, Roberto Mancini was invited in for a “meeting without coffee” with the City top brass and politely asked to pack his things. Three trophies in three years. Two cup finals. Champions League football secured every single season. It wasn’t good enough. The mind boggles as much as the heart despairs. People forget, but bookmakers had Manchester City at a mere 5 to 1 (17%) to win the 2011/12 premier league. The year before that we scraped 3rd place thanks to a final day Chelsea capitulation, in a season spent mostly battling it out with Spurs for 4th. The scarf-toting Italian won the league ahead of schedule and is now being punished for it. My official Too Good-branded cotton pyjamas have been wringing with nervous sweat following three sleepless post-Mancini nights. The Premiership top-table feels like it is at a critical juncture. With United and Chelsea both chopping and changing their managers, this was a rare opportunity for City to capitalise on comparative stability. Instead, we have sportingly levelled the playing field by giving Bob the boot, too. Our owners displaying a hitherto unseen sense of fair play. We’ve joined the uncertainty and it doesn’t feel very nice. There are two ways of looking at the Mancini sacking. There is the “principled approach” and then there’s the “pragmatic approach”. The “principled approach” says we should have stuck with him. There is simply no way he deserved to be sacked. Without any hint of exaggeration, he gave Manchester City fans what, for many of them, will be the greatest singular moment of their lives. No team wins the Premiership every year, and City had every reason to expect to be right up there again next May. Especially so, given the recent departure down the road. Then there is the “pragmatic approach”. Principle’s uglier sister. Brace yourself readers; the pragmatic approach is a far more sinister affair. However, there is a time for the blunt edge of pragmatism. For in nature there are neither rewards nor punishments, only consequences. The “pragmatic approach” says that if Mourinho agrees to come, then it’s worth getting rid of Mancini. 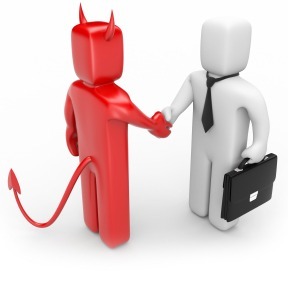 Not a nice thing to do, granted, but sometimes you’ve got to make a pact with the devil. Nobody wanted to get rid of Lee Sharpe. But if you’ve got a Ryan Giggs waiting in (/on) the wing, then it doesn’t matter. Pontius Pilate knew better than most that, while there was a time to keep your hands clean in the first place, there was also a time to give them a good post-backstabbing scrub. Here’s the thing, though. The pragmatic approach has to be worth it. Pragmatism is an ugly bedfellow and one ought not to take it home from the night-club all too often. As the saying goes, you can shear a sheep many times; you can skin it only once. If City were going to skin Mancini, there had to be a damn good reason. Mourinho provides reason enough for the moral compromise. He is the outstanding manager of his generation. I was flabbergasted when it became clear he was not Manchester United’s first choice to replace Ferguson. Mourinho to United was the Doomsday scenario for me. Another 26 trophy-laden years of misery. Thankfully, the power men at Old Trafford came to the conclusion that the defining factor in Ferguson’s success was his Scottishness rather than his managerial brilliance. Those who tar Mourinho with the trouble-maker brush miss the bigger picture. Jose might be fond of a little “creative tension” but his record is exceptional. Two European Cups in his first decade of management. League titles wherever he has gone. Remember the nine year unbeaten home league record? The time for compromising your principles is when you think a Mourinho-sized fish might fancy a nibble. Except, of course, that it doesn’t look like the new City manager will be Mourinho. It looks like it’s going to be Manuel Pellegrini. Pellegrini is a fine manager and may, if hired, prove to be a success at City. But then so was Mancini. Why take the risk? Why go through the upheaval? Simply put, Pellegrini is not worth wielding the pragmatic sword for. The other great fear now is a backlash against the new manager. The analogy is clear between City and Chelsea. Chelsea fans cannot bring themselves to complain about Roman Abramovic, even though the mad oligarch goes through managers like I do portions of potato dauphinoise. So Chelsea fans direct their ire towards the new coach instead. Let’s hope Mancini’s successor is not subject to any similar misplaced anger. One thing you can be quite sure of – you won’t see any mass demonstrations outside the Etihad calling for the billionaire oil men to take their money elsewhere, whoever they choose. We know which side our bread’s buttered on. And there’s an awful lot of butter on that bread. Like a good trophy wife, we’ll keep our mouths shut. After all, rich husbands are in short supply.